Story by Beau Flemister. Photos by Brian Bielmann. On a blustery North Shore day, I follow a very cheerful Brian Bielmann into his home office. Two rambunctious Akitas run circles around us, vying for our attention. Brian’s whistling a tune as if setting our interview to a soundtrack. I can’t help fill in the words to the melody: “All I wanna do is have some fun/I got a feelin’ I’m not the only one …” I soon discover that cheerful is Brian’s only look, peppy his only pace. The tall, lean and permanently bronzed 60-going-on-23-year-old has crow’s-feet and lines mapping his face perhaps less from age or sun than from a smile that rarely rests. The office is what you’d expect from one of surfing’s most successful and prolific photographers. His equipment is organized in neat stations, poised for use: cameras and lenses, tripods, water housings, Pelican cases, lighting equipment and a Costco-size gun safe. Even more impressive than his gear, though, is his massive vinyl collection, a library of music that spans two walls, floor to ceiling, in this large room. The reputation of this collection precedes itself here on the North Shore, but to see it in person is awe-inspiring. “Everything about music, I’m totally addicted to,” Brian proclaims, explaining the collection’s chronological order, cataloged by genre and deeper yet, originals and remasters. In recent years this collection has attracted celebrities from both worlds—surfing and music—to his annual “Record Nights,” intimate and exclusive gatherings attended by Jack Johnson, Kelly Slater, Kirk Hammett and Donavon Frankenreiter. Last year Brian published a portrait series in STAB Magazine where surfing’s greatest came to his house, took the first album they were drawn to and were photographed holding it. I ask Brian why so many surfers are musically inclined, from Jack Johnson to Eddie Vedder to Ben Harper. A winter sunset on O‘ahu’s North Shore, where Brian Bielmann has spent decades as one of surfing’s most successful and prolific photographers. Like many other intrepid young men the world over who saw glimpses of the North Shore’s “Seven-mile Miracle” in magazines, Brian came for the surf, following his big brother who had arrived years earlier. But while his friends went back to their Mainland lives by winter’s end, Brian and his brother stayed put. After a few years beneath the poverty line working odd jobs (shoe salesman at Pearlridge, food inspector in Honolulu), Brian decided to try photography. He took a class at Old Dominion University back in Virginia one summer, and after a perilous wipeout at Rocky Point—requiring stitches to the head—he stayed out of the water for a couple of months, which in turn compelled him to shoot his peers from the beach. His first photo was published in SURFING, a quarter-page image in 1978. Local girls bike to the breaks of the seven-mile miracle. Brian also benefited from right place, right time celestial alignment. The shortboard revolution was in full swing. Big-money events made pro surfing a thing, and it was all happening on the North Shore. Brian shot the stars—Gerry Lopez, Wayne “Rabbit” Bartholomew, Mark Richards, Shaun Tomson—and published in every major surf magazine. But he also quickly realized what remains true for every successful surf photographer: No matter what art school you graduated from, whether you’re a Fulbright scholar or Pulitzer Prize winner, your relationships with the talent trump everything. When the neon-splattered ’80s swung around, Brian hopped the Pacific to Los Angeles to learn the ropes of high-fashion photography. Beyond the fashion sets, he landed a gig shooting Australian celebrities around town for Aussie gossip magazines. Brian stayed in LA only during summer—he’s never missed a winter on the North Shore since moving there, he says. Keen to harness his fashion experience and even more his connection to major LA modeling agencies, SURFING (among others) began tapping Brian as their go-to guy for swimsuit issues and editorial. He also brought the trends he’d see on fashion shoots to his work for surf apparel brands like Quiksilver and Billabong, which later sent Brian to Australia, Tahiti, Fiji and Indonesia to shoot their campaigns or team riders in events. While his fashion chops were a major asset for brands, what also set Brian apart was his comfort in treacherous waters. He would swim out at Pipeline in whatever conditions the talent could handle—not that he always returned unscathed. In the late ’90s, for instance, while shooting a contest at Pipeline from the back of a jet ski, he and the driver were bucked off the craft by a wall of whitewater. Brian’s water housing slammed into his face so hard that the Plexiglas cracked, requiring a dozen stitches. The unmanned jet ski flipped on top of him and nearly drowned him. Unlike many who come for the winter surf season, Bielmann lives year-round on the North Shore, allowing him to document life in “the country” in a way no other surf photographer has. His heaviest moment in the water happened just two years ago in the early morning of the Quiksilver Eddie Aikau Big Wave Invitational at Waimea Bay. Waves with sixty-foot faces were closing out the entire bay. Shooting from the back of a jet ski again and unable to make it over one of the sets, Brian and his driver had to double back toward shore and literally ride one of those mountains to a safer part of the bay. By the turn of the millennium, Brian had created such a name for himself, both as a fearless waterman and Goodtime Charlie, that he was hired by the young, most progressive surf magazine of the time, Transworld Surf. There, over a fifteen-year stint, Brian produced his most career-defining work, capturing images that remain iconic today: Andy Irons’ shadowy paddle-out at empty Pipeline or Nathan Fletcher’s terrifying airdrop into a black hole during the “Code Red” swell that hit Teahupo‘o, Tahiti, in 2011. Fully entrenched in the North Shore surf scene, Brian had exclusive access to everything that happened on land and sea: the intense action in the lineup and the behind-the-scenes drama in the houses lining the beach at Pipeline, which the major surf brands rent for their athletes each winter. It was during this era (2002 to 2010) that Brian documented one of the fiercest rivalries the sport has seen: Kelly Slater vs. Andy Irons. The world champion eleven times over, Slater ruled the better part of the ’90s, earning six titles before the new millennium. In 2002 he met his match: Kaua‘i’s Andy Irons became Hawai‘i’s very own “kingslayer,” literally drawing Slater out of his (first) retirement. Irons defeated the man and won three titles in a row from 2002 to 2004. All of them came down to a tense battle in Hawai‘i every winter season at the climax event, the Billabong Pipe Masters. Slater wouldn’t win another title until 2005. The two were, as Brian would say, like rock stars, and Banzai Pipeline their Madison Square Garden. Every fan took sides; you were either Team Kelly or Team Andy. Slater was the Beatles: groundbreaking, polished and pleasing. Irons was the Stones: cocky, raw and angry. Brian was on the scene, finger on the trigger, shooting every battle in their feud. One memorable image—a tight shot of Irons’ face as he’s being carried on his brother’s shoulders after beating Slater at Pipe to win the world title—captures Irons’ sheer elation and subtle relief. During this time, Brian was winning awards, from the prestigious Red Bull Illume to the annual American Photo Magazine Award. He began to experiment with underwater photography, and the images he produced below the surface would become some of his most recognizable, imitated by many after him. One of those most famous, which Brian calls “Angry Skies,” captures three surf photographers dunking beneath a large wave in Tahiti, the mighty turbulence of the wave hanging like an apocalyptic cloud above them. The shot was actually a fluke, Brian says, a moment when he looked down while everyone else was looking up. “I still love using my long lens, which is kind of passé for most photographers these days. But with a longer lens you get a super tight look, where you can feel the emotion of the surfer,” says Bielmann. Joking aside (though that really is his cover count), Brian has nothing to fear from industry disruption. The scope and quality of his work, coupled with his happy-go-lucky rep, has made his very name a trusted brand—the goal for any photographer in the game. His underwater work brought Guinness to his door for a global ad campaign. Gap, Athleta and Western Digital have recently hired him. Using his penchant for storytelling, Brian does speaking engagements, including a TEDx Talk for IBM on Hawai‘i Island alongside Ron Howard and Idina Menzel. He sells limited prints, does gallery shows and will tour Australia this spring teaching photo workshops sponsored by Canon. I ask Brian if he’s ever considered leaving the North Shore for longer than a summer. 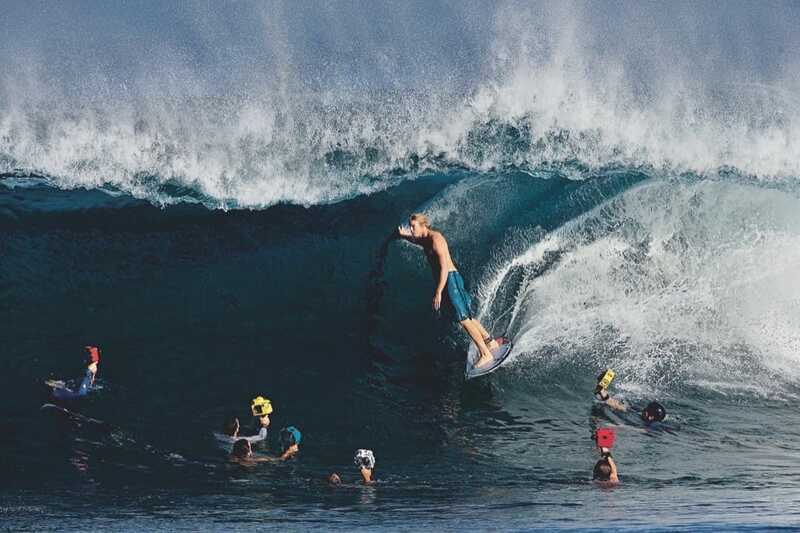 After decades the World Surf League is reshuffling its deck of events, and the North Shore leg of the tour seems less a focus. He shakes his head like I’m crazy. I don’t know if I’m still hearing the Akitas at the door or if Brian’s jonesing to get in the water, but he seems antsy. We wrap it up, and I ask him what’s next.